Take a look around Motel One Glasgow, a design led hotel which offers premium facilities at budget prices. Glasgow is a vibrant, cosmopolitan city with a mass of things to see and do. And staying in the heart of the city is the best way to be right in the middle of everything that is going on. 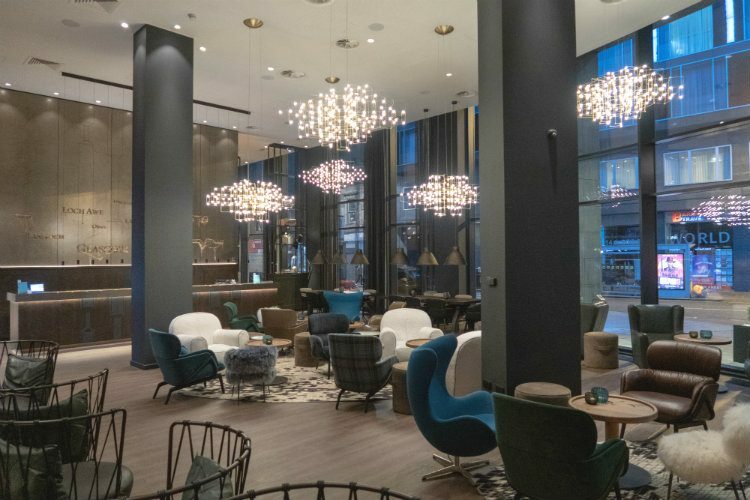 If you’re looking for a hotel that’s a little more luxurious than most chain hotels, but still want to keep your costs down, then the Motel One Glasgow hotel is perfect! I stayed there when I stopped off in Glasgow on my way to the West Coast of Scotland last year. I found that it’s a design-led hotel which offers a touch of luxury at a very affordable price. Reaching Glasgow is easy, whether you are travelling by air, road or rail. Glasgow International Airport is served by flights from a long list of UK and international cities. Once you arrive at the airport, it’s just a 15 minute drive to the city centre, and there’s a regular bus service available as well. The hotel has a fantastic city centre location, and it is ideally placed if you’re travelling by train, as it is within a 10 minute walk from both Queen Street station and Glasgow Central station. If you’re driving into the city centre, be aware that the hotel doesn’t have its own car park. There is an NCP carpark a short walk from the hotel. Motel One Glasgow opened in 2018, and was very new when I stayed there. You enter the hotel through tall glass doors, straight into its lobby area with high ceilings and dramatic lighting. The space feels very modern and elegant, with plenty of seating dotted around. After checking in, I took the lift up to my room on the ninth floor of the hotel. The room was reasonably small but it was also beautifully designed. The high quality bed linen ensures a comfortable night’s sleep, and I love the vibrant blue-green of the furnishings. They’ve even thought of things like putting both UK and EU plug sockets at the bedside, along with USB charging points. A small hospitality tray was provided with a selection of tea and coffee, and there was a squishy leather chair to relax in. Free wifi doesn’t always come as standard in hotels at this price point, so I was very pleased to see that it’s available throughout Motel One hotels. And the room was also furnished with a decent sized TV at the foot of the bed. And if you’ve ever felt that budget hotels sometimes skimp on the bathroom, that’s not the case at Motel One Glasgow. Yes, the shower room was compact, but the elegant fittings, powerful shower and free toiletries were impressive. And it was spotlessly clean as well. After settling into my room, I headed downstairs to find somewhere for dinner. Motel One Glasgow doesn’t have its own restaurant, but as you are in the heart of the city, you’re sure to find somewhere suitable. I enjoyed a delicious meal in glitzy surroundings at The Grill on the Corner, and then headed back to the hotel to catch up on a little work. The cosy bar has a decent selection of drinks, and I took a glass of wine into the hotel lobby to enjoy while I worked. After that, I was ready for sleep, and the comfortable bed in my room ensured that I slept soundly. MotelOne doesn’t offer a cooked breakfast, but their continental style breakfast but is a very good one. Each MotelOne has a different range of produce reflecting its location. The Glasgow hotel offers a range of excellent pastries that were light, crisp and tastier than those you generally get in a hotel in this price range. There’s also a selection of breads, cheeses, meats, fresh fruit and even some Scottish jams. You could also choose to start your day with a boiled egg. When I visited, the eggs were decorated ready for Halloween! Altogether I thought that Motel One offers excellent service for a very reasonable price. Rooms at the MotelOne Glasgow start from just £69 which is comparable with some of the budget chains, but the design and service don’t feel like a budget hotel. Motel One has hotels in nine European countries, and there are currently five Motel One hotels in the UK. As well as Glasgow, they have properties in Edinburgh, London, Manchester and Newcastle. I was very impressed with my stay at Motel One Glasgow, and will certainly consider using them again.